Distribution and fulfillment center managers can now order the most popular labels, printers and scanners from a single online source. From a single online source, our fulfillment center and DC managers can order labels, printers and scanners as well as toner cartridges. 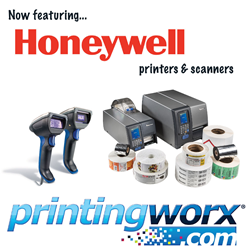 Printingworx.com® today announced that, in addition to the one billion plus labels they provide to distribution centers annually, they now offer Honeywell® printers and scanners in their online offering. Distribution and fulfillment center managers can now order the most popular labels, printers and scanners from a single online source. The printer offering includes the PM43, PX4 and PX6 series of Honeywell® thermal printers, most commonly used by distribution centers for printing barcodes and shipping label information. Customers will also find the most popular, high performance offering of barcode scanners including the Granit® Industrial Grade Laser Scanner 1280i and the 1980-8i. The Honeywell® SR61, SF61, 1450-52g and the 1900-1902 series of handheld barcode scanners. “By adding barcode and shipping label printers and scanners to our offering, we come a step closer to having everything needed by our distribution centers to get packages quickly and accurately out the door,” stated Michael Del Chiaro founder of printingworx.com®. “From a single online source, our fulfillment center and DC managers can order labels, printers and scanners as well as toner cartridges,” continued Del Chiaro. “Our customer can expect the same levels of service and quality we provide on their labels with printers and scanners,” concluded Del Chiaro. While the online offering features popular printers and scanners and ease of ordering, customers requiring other brands or models should contact customer service. The company is a full service supplier of all of the system based supplies used by distribution centers across North America. This includes labels, printers, packing slips, scanners, and toner supplies. Printingworx.com®. We are a preferred supplier for the largest distribution-fulfillment centers in the world, producing over a billion labels annually. We’ve been providing distribution center services, systems and supplies long enough to have learned this valuable lesson: The relationship we form with customers and our product expertise are the keys to our mutual success.